It's been a pretty exciting week! Our business cards came, we've had a few enquiries for future lessons and we've gotten a whole heap of views from out event announcement on Facebook! Today I spoke with one of the folks at Studio for Hire and I am spending tonight working on booking out our events for August and September. Mending and Hand-Stitching social- an evening of casual sewing, asking questions and, of course, wine! Sewing Machine 101- we'll make a small sampler of stitches to show off what your machine can do, talk through the most common presser feet and when to use them as well as learn how to insert a zipper! Reading and Using Patterns- bring a pattern to learn about or work with one of our favorites. We'll cover taking measurements, how to pick your fabric and initial pattern adjustments. Learn how to trace off a pattern to customize it to your needs and preserve your originals. Sometimes I want a sweet. Often, after lunch, I desperately want a donut. A piece of cake. A crunchy cookie with just the right balance of crisp salty bite and sweet, gooey center... Alas, I musn't eat cookies and cake at every hour of every day. So, sometimes when the fever strikes I look for delicious-looking things that are, in fact, not edible and totally enjoyable on their own. Happy perusing. Looks good enough to eat, though eating it might not bode so well. 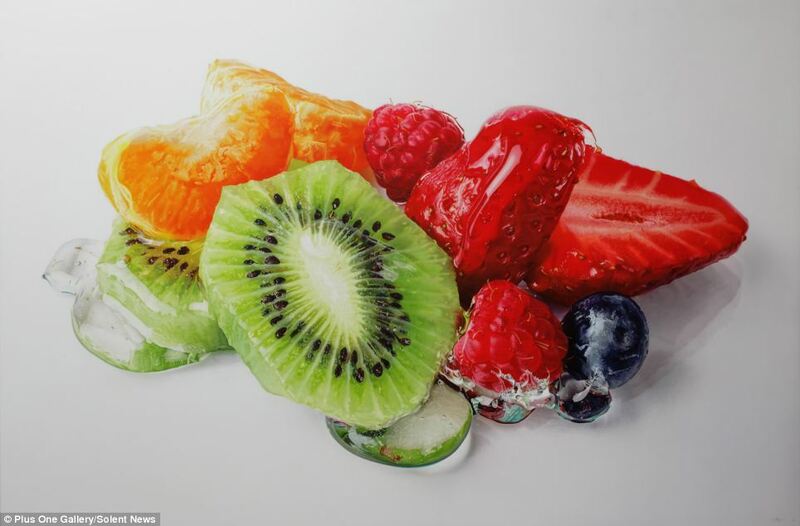 A painting, not real fruit! It's been an exciting week for Teach. I met with a woman last weekend to discuss our screen printing and block printing workshops and to generally introduce her to the idea of Teach. She was super psyched and we are taking the week to brainstorm ideas for how she would want her classes structured. Then, last night! I went to see a potential classroom space in NE Minneapolis! Indie Business Central is an up-and-coming (like us!) business with a focus on supporting and growing the small- and micro-business community. One of the co-owners Heidi made the time to meet with me and she is so passionate about her vision for the space and how they want to grow it. There are a few details still to work out (like whether to invest in portable tables) in order to use the space but I think we will have a few events there over the coming months. Overall, a great visit and so exciting to see other businesses working it out. It wasn’t all that long ago that I realized my wardrobe has become a sea of black, knit, minimalist things. I started slipping toward all-black all-the-time telling myself it was easy, chic. That it was slimming. That it would make dressing for work streamlined and classy. I was wrong, though. When I really looked at myself and my closet I had to admit that I was buying whatever fit and was black. It wasn’t chic or fashionable. I was giving up, hiding. I would take an enormous pile of things into the dressing room and have to shore up my self-esteem to see my body in the three-way mirror, see how badly things fit and how different the shape of my body was from the garments available to me. I’ve known how to sew for a long time. At a whopping 4’11” I need to hem or tailor most anything I might buy, anyway. Sewing was as much a life skill as a hobby. I wasn’t happy with the way things were going at work or with my body and I needed a change. So I changed my clothes. I started sewing up circle skirts and peasant blouses. I adopted 40’s and 50’s silhouettes knowing we could embrace each other. I started out wanting to make things that would look good and feel good and not be complicated or uncomfortable. I started making dresses and falling in love with novelty prints. I started getting comments and compliments when I left the house. I felt amazing. My body wasn’t wrong, my mind was soothed by hours spent cutting, pinning and stitching. I started getting asked if I make my dresses for other people? Still I wanted something more. I love teaching. I feel like my whole, best self when I am helping someone learn. Whether it’s sharing a new skill, opening up eyes and minds and hearts to new and inspiring ideas or even just tweaking and reinforcing old skills my heart races and my whole being lights up. I wanted to teach other folks how to do the things for themselves that made me so happy. Being self-sufficient is so rewarding and fulfilling. I want to give those skills to other folks and enable them to be rock stars in their own lives. That’s why I started Teach. I wear my heart on my sleeve and tote my soap box of joy around and get to feel my best while helping other folks get to their best, too. Funny how a little clothing can change your life. Holidays in recap, no such thing as too late! This post is crazy late but oh well. Can't thrash myself too much for that or I really will never blog again. Who knows who reads these mutterings, anywho, right? This year marked the first time I stayed in MN instead of traveling home to NJ and Philly. I gotta say, it was a little weird. Here is a view of walking into work Christmas week. Minneapolis is home to the great Skyway, a human habitrail... Usually hoppin' with people in the morning. Bustling along to work, furiously thumbing their smartphones. On this day, however, I saw exactly 2 people in the Skyway. I dub this season in the habitrail, the sky-pacalypse! Outside of the working world, though, it was all twinkle lights, wrapping paper and cookie dough. The night we decorated the tree we snapped a few pictures and I have to say this one of the three of us is my most favorite of us ever. It’s pretty much how it feels when we are home together. Christmas Eve the Pickle had neither school nor un-school coverage so we got to spend the day home in our pajamas. I tried in vain to work and found myself being pulled away from my laptop by an overexcited 5 year old many times. Go figure. It must have been a holiday or something…! We made two batches of chocolate chip cookies and holey moley I thought the spooning and baking would never end! The recipe made enormous batches. Next time we’ll know better. Batter. Dough. We rounded out the holiday season with a trip to Racine to see my dude’s family. I was enjoying the couch and the company too much to be snapping pictures the whole visit but I did happily snap this one of the Pickle and her cousin building one of the largest forts I have seen in all my fort building days. They told me it had two floors. And No Grownups. Except for a brief tour for daddy. Some of my favorite bits included my first purple Bakelite, this stunning and large brooch from the Pickle and a necklace, and my first ever Malco Modes petticoat! My mom also sent out a package with some very sweet, thoughtful treats. Watching my dude and the kiddo opening the packages was fun and the items she sent made me a little teary. She included a cast iron bottle opener she’d found with dad on their honeymoon antiquing trip, a maiden size Bakelite bracelet for the Pickle and a carved black bangle for me. Each item felt laden with sentiment and I missed her more than anything seeing each item emerge from the tissue. It was a great holiday season and it was nice to have everyone trickle back in to work after the holidays wrapped. Now we’re looking forward to the end of the month when we depart for a two week adventure in… South Africa! So pumped! Capetown and an intrepid trek to Lesotho to visit the village where I served in the Peace Corps. Just days away. And I promise there will be more pictures when I get back! So this has taken forever! I finished this dress over the summer and have worn it a whole bunch of times. I was pretty damn pleased with the results. I did a post on the making back in August (August!?!?!) and here we are, live in the in the flesh. Or fabric. I admit that a big part of what keeps me from blogging about my finished garments is really that I have a hard time snagging a good spot to take photos. With a 5 year old in the house and my full-time job plus teaching nights I get caught up with myself and have a hard time wanting to tear myself away from sewing versus taking pictures of the dresses and outfits I so love wearing. Dear readers, whoever you might be, I promise not to make sucky excuses in future about not being able to snap a few photos. Poor snaps are better than no snaps. Done. Moving on. This was my first try at making a dress with a pleated skirt. Like I said at the start, super pleased with the results! I did it free-hand using inverted box pleats. The only thing that really went wrong was the alignment of the front pleats with the waist darts. Fortunately the busy print keeps anyone by me from noticing. Woo? On the right you can my sweater bag. Cardigans in many colors and shapes, organized into warm, cool and neutral stacks. In truth, my sweater bag lives in my dude's closet. Mine, although the larger of the two bedroom closets, isn't big enough. It's love. So with so many fun choices how do I decide what to make next? How do I balance pattern selections? What makes a good scale, color, texture choice? Below I'll walk you through some snaps of a recent trip our to my favorite fabric warehouse! Most of my fabric choices are a variety of quilting cottons, which simplifies things a bit. I like working with quilting cottons, easy to sew, easy to care for and SO MANY CHOICES!!! Here's a stack I had gathered up, trying to work out what I should get and what wouldn't make the cut! If you ever see that weird lady in the fabric store draping fabric over herself... think of me. I'm that lady. It's really one of the best ways to understand how a pattern will be affected by the curves of your body, whether the scale will work for you, if the color is flattering. This pretty light yellow-green fabric was a definite thumbs-down. Looking at my skin next to this fabric I felt super washed out. I love the scale and that the pattern offers fun possibilities for using on-grain or on-bias. Sadly, it didn't make the cut. I struggle with feedsack patterns. I really liked this color but this particular fabric was a plaid crepe with varying levels of sheerness/opacity. I don't like to line my skirts so this one didn't make the cut either. Oh man, I went back and forth on this fabric for a long time. I think I worked through the stack and came back to it 2 or three times. I so love the energy of this print, it's a little wild and fireworks-y and the shade of pink is nice and versatile. I loved the idea of the fabric in a skirt and kept imagining twirling in a circle skirt of pink fireworks... but I could not get a good image in my head with the fabric for a bodice. Who knows, perhaps next time I will see the boom boom pow pattern again. Didn't make it this time. At this point I am guessing you might be wondering well... what did you get? I loved this crosshatch. I like the smallness of the different elements in the pattern and how it is balanced out by the all-over, irregular cross-hatch. From a few feet away the pattern did not break into distinct boxes or stripes, also a major plus. The dots here are green, blue, white and brown. The background is pink with a darker pink crosshatch. Very flexible for cardigans. We had a winner! You can kind of see it in my secret-excited little smirk here; I loved this fabric. It said, Barbie Throws a Party or Donna Reed's Summer Shindig or Please Wear Me With Little White Gloves!!! I brought this one home. Classic polka dots with bold pink roses breaking things up. I like irregular polka dots as I find that straight polka dot matrices make my eyes water, they look like they are vibrating. So this was a perfect solution. Sadly, one more that did not make the cut. These are the kinds of fabrics and patterns that I really love and really wish worked for me. You can see how wan and washed out I look next to it. The pattern has a fun Deco look but I just couldn't get something that would look so blah in color next to my skin. I regularly make another round through the store after cutting my initial choices. First off, they ask you to reshelve your fabrics yourself. Second, I almost always feel like I will find one more thing now that I am in the zone. Here is a shot of all the lucky home-comers from the last go-around. You can see a whole bunch of things that didn't make the pictures. Some of these I felt so strongly about I didn't both with pictures for. I have finished 4 dresses from these fabrics so far. The Lemon Surprise fabric was a 2nd round find as was the chambray with discharge print roses in the upper right hand corner. I finally got a tripod for my camera so more outfit posts on the way! Hurray! Hopefully this helped expand your horizons of print and pattern possibilities! On a beautiful day this Autumn I stumbled across this gorgeous enamel pin tucked into the chaos of an antique mall shelf in Hopkins. It was one of those moments where you say, "Yes, I shall buy that. I know it." I could just tell by looking at it in that one glance I wanted to touch it and hold it and wear it. And it was a good price ($12) to boot! I noticed right away that it smelled strongly of antique mall. I didn't think much of it. It had a goo weight in my hand. I loved the color and the size. I loved how different the shape was from most enamel flower pins I come across. And it's red! I love a pop of red. For removing light scuffing from Bakelite, Lucite and other plastic jewelry... Brasso! Brasso contains ammonia so be sure to use outdoors or in another, well-ventilated area. If you do a little research on restoring Bakelite you'll see that folks use all sorts of methods and products. Brasso is commonly available in your local hardware store (maybe even the grocery store!) and inexpensive. While you aren't likely to remove much patina from Bakelite with Brasso alone it is great for cleaning up the surface and improving the appearance of scuffs and smudge marks. For tweaking, opening, closing, fixing and monkeying... a good pair of needle nose pliers! This happens all the time, right? You find that awesome necklace/brooch/zippered dress and you have the darnedest time getting it open and closed. One of the great things about vintage and antique goods is that it was loved before. Sometimes really loved. Clasps get yanked, zippers get caught, catches get squished. I have more than a few items that needed just a tweak from my trusty pliers to regain their life and easy of use. Having the right tools can help protect and prolong the life of your most-loved vintage and antique pieces. Just remember to treat them gently. For so many cleaning, primping and polishing needs... q-tips and cotton balls! Instead of tearing off bits of toilet paper or paper towel, do yourself a favor and grab a cotton ball or a q-tip. Perhaps you are reading this and thinking, well, duh... But you know you've done it. Trying to clean something up and cutting corners because you just want to get it done and fast. One of the biggest benefits of cotton balls and q-tips is that the materials conforms to the shape of what you are cleaning. Trying to wedge a bit of towel into a crevice doesn't give you much control and it exhausts really quickly. If you are using a cleaning agent the cotton will hold and apply it evenly. Cotton is also very gentle and if you get buts stuck you can usually pull them out as the fibers stay intact, unlike paper towel or tissue that breaks apart. I love this storage idea! If you click on the image it will bring you to a whole slew of fun mason jar storage ideas from Hip2Save. I'll update you on cleaning my enamel flower. If you have any tips I would be most grateful! If you will forgive me my poor selfie skills at current I promise to keep working on them! Without further ado... The Baronica dress! Our friend Barry and Monica got hitched in August and you might recall that I shared some images of this dress before, just after I finished it. I applie teal rick rack of differing sizes at the neck and hem and also finished the inside hem with some bright orange grosgrain ribbon which adds a fun pop of color when the hem flips up. I have been surprised how many colors pairs well with this combo and find myself rotating between shades of pink, orange, black and brown when I pair the dress with a cardigan. Sometime soon I'll post a step-by-step on how I have shortened my legion of cardigans to better suit the proportions of my dresses and skirts. It's super easy and makes the world your oyster of cardigan shopping! I've been bummed to find that so many cropped cardigans are acrylic and nylon based. Blech. My bracelets today are a mix of Bakelite and plastic. The three thinner bangles are each marbled in subtle ways. the top bangle is a bright orangey pink that I am working (very slowly!) to remove the patina from. I'm anxious to hear any tips anyone has!